The role of a goalkeeper has evolved as much as the beautiful game itself over the past 50 years. Go back to the 1960s-70s and you would’ve seen that even the best stoppers in the world used to keep that old, heavy leather ball out with their bare hands. Nowadays our often unsung number 1s have a range of gloves with the latest technology, but they can no longer handle the ball from a back pass and are expected to have the passing range of Paul Scholes. Players: Champions League – David de Ge (Manchester United), Marc-Andre ter Stegen (Barcelona), André Onana (Ajax). Europa League: Kepa Arrizabalaga (Chelsea), Murara Neto (Valencia), Kevin Trapp (Frankfurt). One of the most popular gloves on the market, the adidas Predator Pro gloves are worn by six of the goalkeepers we’re looking at. 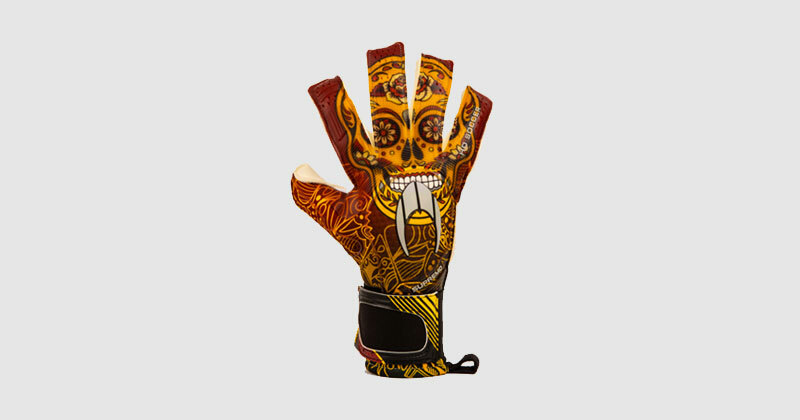 Advertised as ‘match gloves cut to get to grips with shot stopping’, the palm has a 3.5mm of cushioning and URG 2.0 latex to take the sting out of the fiercest shots around. They shouldn’t be worried about catching in April showers either as the Predator Pro gloves, which are available in Solar Yellow, Bold Blue and Active Red, have grippy latex which help cling to the football in any type of condition. With fingers cut snug and a close-fitting elastic neoprene wristband that circles the wrist twice, our stoppers are treated to a stable and natural fit. Modern day keepers, especially those on the continent, tend to like punching the ball, something that the Predator Pro’s backhand with silicon reinforcements is perfect for. Not currently available to purchase are David de Gea’s special-edition white version, which were launched following the Manchester United keeper’s 100th Premier League clean sheet in February’s goalless draw against Liverpool. 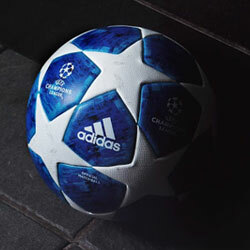 Players: Champions League – Iker Casillas (FC Porto). 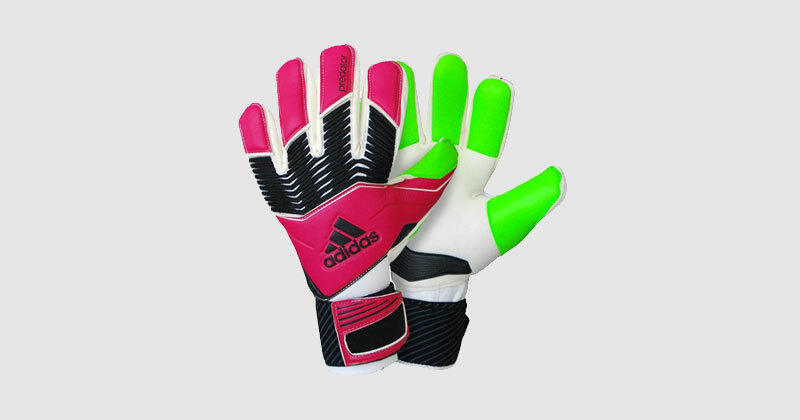 A different pair in the adidas Predator glove range, the Predator ZONES claim to take the famous range to a whole new level. Worn occasionally alongside the Predator Pros by Spanish legend and current FC Porto goalkeeper Iker Casillas, they feature special negative cut with latex gussets for a seamless touch and snug fit. Protection comes in the form of a double thumb wrap which offers increased stability all-round. The palm is made from 3.5mm Nova Foam and 4mm cushioning for maximum grip and control for that all important catching and distribution. Nova Zone tech zones for ultimate grip also feature on the fingers should limit any errors. The wrist is very similar to the Predator Pro in that it has a close-fitting bandage which forms a natural fit for all different sizes. Players: Champions League – Alisson Becker (Liverpool), Ederson Santana de Moraes (Manchester City). 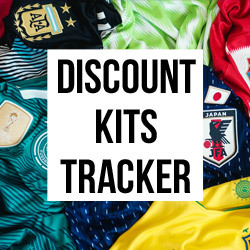 Like their fantastic boot range, Nike also have a wide selection of goalkeeping products to select from with the Mercurial Touch, Premier, GK Grip, Spyne Promo and Gunn Cut Promo all available. 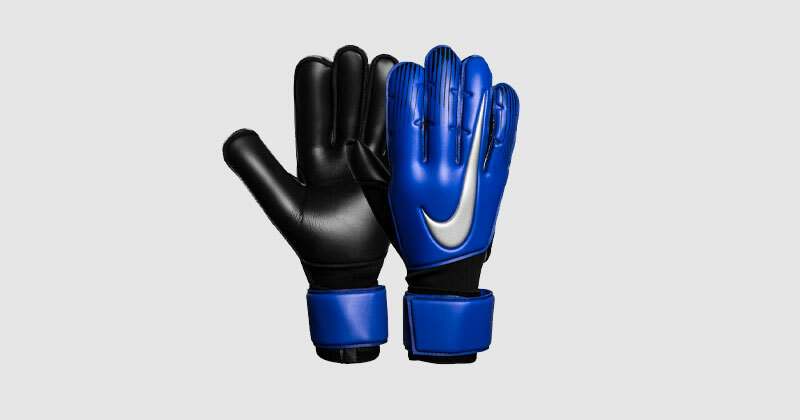 However, we’re focussing on the pinnacle of Nike gloves, the Vapor Grip3, donned by two Brazilians in Liverpool’s Alisson Becker and Manchester City’s Ederson Santana de Moraes. These mitts lead the brand’s #AlwaysForward Pack and it’s easy to see why. The Vapor Grip3’s feature updated sticky 4mm foam to help absorb powerful strikes and offer ultimate grip for ultimate control whatever the conditions. Whether it’s training or those big European nights, the slim fit, which features less fabric than previous generations, and ventilated design allows for a comfortable experience with zero distractions. The Vapor Grip3’s patented Grip3 technology featuring a reverse stitch on the two middle fingers plus a wrapped thumb, index and small finger gives the person between the sticks even more feel and control. Available in Volt/Black/Black, Anthracite/Black/Opti Yellow, Racer Blue/Black/Metallic Silver, or just black, the gloves’ ventilated mesh backhand allows for cool airflow, while a wraparound wristband can be easily adjusted for the stopper’s comfort. Players: Champions League – Hugo Lloris (Tottenham Hotspur), Wojciech Szczęsny (Juventus). 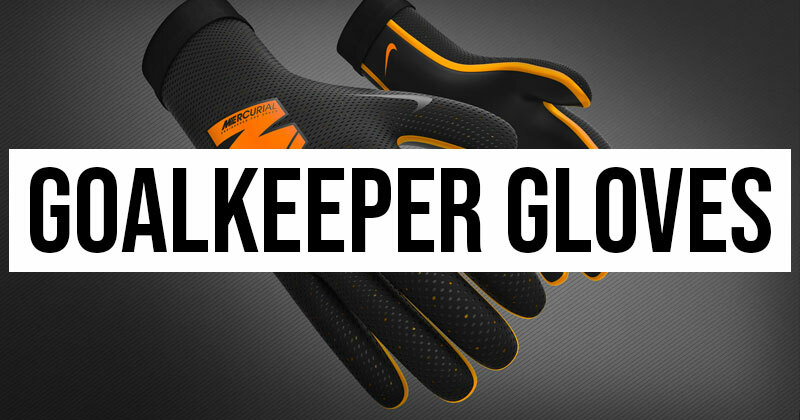 Now to a brand you may not have heard of before but one that are certainly making waves (or should that be saves) when it comes to goalkeeper gloves. 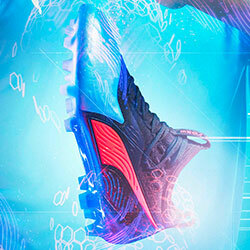 Born in Germany and now with their headquarters in Italy, Reusch specialise in football and winter sports equipment. 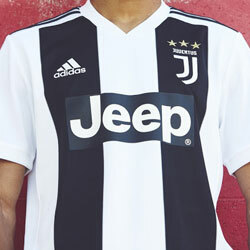 First making a name for themselves by sponsoring Germany’s 1974 World Cup winning goalkeeper Sepp Maier, Reusch’s current roster features France’s reigning World Cup winning captain Hugo Lloris, plus Juventus’ Wojciech Szczęsny and Napoli’s Alex Meret. This talented trio wear the brand’s ultimate product – the Fit Control G3 Fusion gloves. Made with the highest quality materials, the product possesses G3 Ultra Soft foam fused with speckled latex to boost the palm’s all-round performance. This applies even in wet weather with innovative Hydrograin technology which push the grip in rainy conditions to a new level. Reusch’s patented Ortho-Tec five-finger removable protection allows unsurpassed flexibility and customisation, while the 3-D Thumb Crotch between the thumb and index finger eliminates any seams that can cause a distraction. 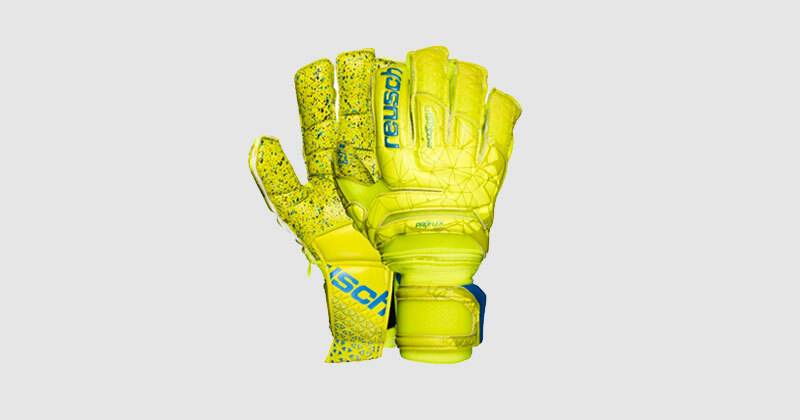 Available in lime/ safety yellow / lime and blue/ lime/ lime, Reusch have combined specific stretch materials to invent the best backhand flexibility. The Advanced Shockshield provides additional protection when punching, or getting stepped, and AirVentSystem uses highly breathable Air Mesh material for unbeatable comfort. With the cut of a Flat and Roll goalkeeper glove, Dual Rolled Expanse Cut ESS, Expanded Finger Tips and Backhand Side Wrap allow for better hand positioning when facing incoming shots and maximises the contact area. The Elastic Duraloop strap has a wider wrist bandage for a better fit, more support. Now to Puma’s elite offering when it comes to goalkeeper gloves. 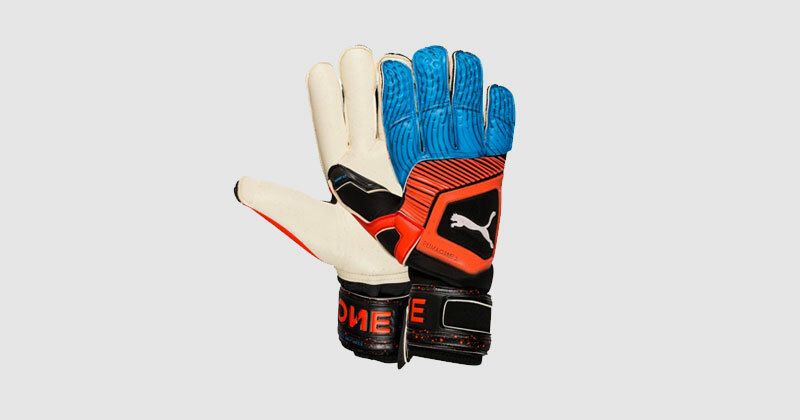 The top-level Puma One Grip features a 4mm Ultimate Grip Latex palm for grip in both wet and dry conditions. Worn by two stoppers aiming for Europa League glory in Bernd Leno of Arsenal and Ondřej Kolář of Slavia Prague, the latex embossed and segmented backhand provides protection and ultimate freedom of movement. On top of that, mesh finger gussets and inserts at the thumb add much sought after breathability, while an elasticated wrist and full-length wrist strap provide secure closure and support. Available in a number of colours including Black/ Grey/ Green/ Gecko, Black-Bleu / Azur-Red Blast, White / Shocking Orange and more, the Puma One Grip’s anatomically correct tooling helps the fingers spread naturally for ultimate comfort and flexibility. Players: Europa League – Andres Fernandez (Villarreal). The only brand on the list solely dedicated to goalkeepers, HO Soccer are true specialists when it comes to making products for those who saving a shot can feel as good as an outfield player does scoring. Their latest super lightweight offering is Villarreal ‘keeper Andres Fernandez’s SUPREMO PRO 2 gloves. The balance of comfort, performance and flexibility is what HO, like the previously mentioned companies, have executed with the SUPREMO PRO 2. A new TC FLEECE in the back body gives the stopper effective temperature regulation of the hand while, on the neoprene backhand, a new 3D Gel Printing Shield makes for adequate protection when punching clear. Its 4mm AQUA FORMULA latex palm has internal silicone inserts strategically positioned for increased stability in any condition. More fresh innovation in the shape of its KONTAKT Evolution palm and new style elasticated wrist with double fastening and velcro adjustment offers the secure fit of a roll finger glove but without the seams. Unlike some of the other products we’ve looked at, the SUPREMO PRO 2’s soft and comfortable Neoprene body is available in a wide-range of colours from Blue/ Lime Black, Flash Pink/ Black/ White and, a personal favourite, Burgundy/ Yellow/ White with an embroidered skull design. 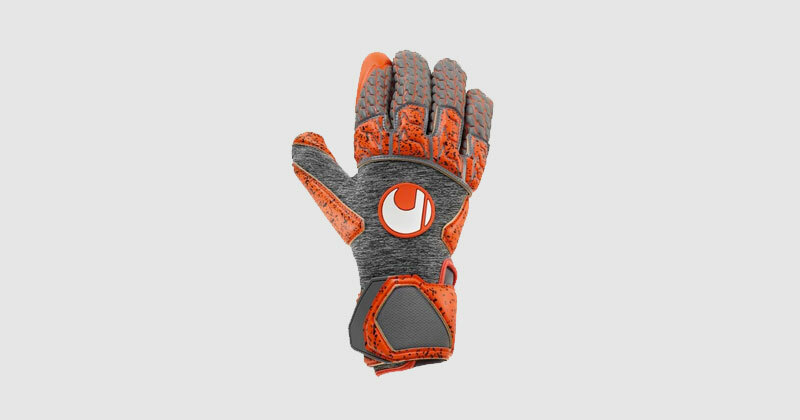 The third German sports brand on our list, alongside adidas and Reusch, uhlsport are also held in high regard when it comes to manufacturing gloves. 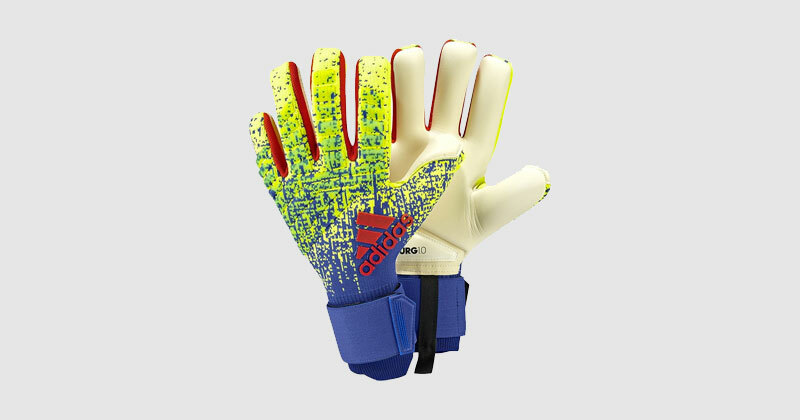 Their latest offering worn by Benfica’s Greek Europa League chasing goalkeeper Odisseas Vlachodimos is the striking Aerored Supergrip. Featuring new innovative uhlsport-SUPERGRIP foam, the gloves provide a higher grip level thanks to integrated elements. The backhand is very flexible due to its comfortable material mix of latex and neoprene which, along with a SHOCKZONE, helps when it comes to punching the ball. Around the fingers, a newly developed Fingersurround-cut makes for a tight fitting and perfect surround grip, while the Aerored’s semi-elastic Supergrip latex flap with full neoprene mesh bandage is easily adaptable and comfortable on the wrists. Available in a Dark Grey Melange/ Flu Red/ White colour combination, the product’s neoprene body is one of the most attractive on the market.